Incorporating exercise and movement throughout the school day makes students less fidgety and more focused on learning. Editor’s note: This post was co-authored by Marcus Conyers who, with Donna Wilson, is co-developer of the M.S. and Ed.S. Brain-Based Teaching degree programs at Nova Southeastern University. They have written several books, including Five Big Ideas for Effective Teaching: Connecting Mind, Brain, and Education Research to Classroom Practice. Incorporating exercise and movement throughout the school day makes students less fidgety and more focused on learning. Improving on-task behavior and reducing classroom management challenges are among the most obvious benefits of adding physical activities to your teaching toolkit. As research continues to explore how exercise facilitates the brain's readiness and ability to learn and retain information, we recommend several strategies to use with students and to boost teachers’ body and brain health. In fact, John Ratey, author of A User’s Guide to the Brain, calls exercise “Miracle-Gro for the brain” because of its role in stimulating nerve growth factors. Studies suggest that regular physical activity supports healthy child development by improving memory, concentration, and positive outlook. For example, researchers found that children who had an opportunity to run for 15 to 45 minutes before class were less distracted and more attentive to schoolwork. These positive effects lasted two to four hours after their workouts. The connection between learning and exercise seems to be especially strong for elementary school students. Given these findings, cutting back on physical education with the aim of improving academic performance, as some districts have done or may be considering, is likely to be counterproductive. Regular physical activity is an essential component for maintaining body and brain health for people of all ages. A recent study involving 120 people found that walking briskly for 30 to 40 minutes a day three times a week helped to regrow the structures of the brain linked to cognitive decline in older adults. The effect was the equivalent of stopping the brain’s aging clock by one to two years. By incorporating movement and physical activity into the school day, you can support student learning in a variety of ways. Start the day with movement: Many teachers we know start the school day with exercises such as jumping jacks, arm crosses, and stretches. Kim Poore, who teaches K–5 students with behavioral and emotional disorders in South Carolina’s Lancaster County Public School District, tells us that her class has led the school in a morning warm-up routine broadcast to classrooms over closed-circuit TV. 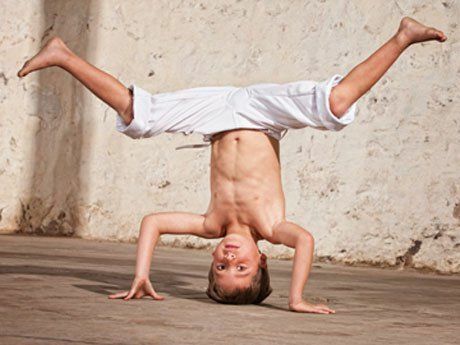 Enhance attention during and between lessons: Incorporating short exercise or stretch breaks into lessons can resharpen children’s focus on learning. Especially for younger students, dividing lessons into 8- to 20-minute chunks punctuated with activities that involve movement keeps their attention on learning and helps make the content more memorable. Exercise and stretch breaks also work well during transitions between lessons. Poore says that one of her students’ favorite ways to prepare for tests is with an activity she calls Snowball. She writes a test review question on a piece of paper, wads it into a ball, and tosses it to a student, who opens it, responds to the question, and tosses it back. “It’s a fresh and effective way to reach these kids,” she says. 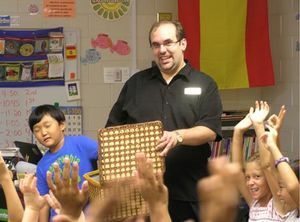 Spanish teacher Joe Uriz engages students’ senses with his mystery box activity.